Natasha and Joseph were married on the 14th October 2017, with a reception for 170 guests held at the beautiful Joondalup resort. Wedding cake was to be served as desert portions. Cake was made using two different flavours, you can view all our flavours by clicking here. Please feel free to contact us if you do not see your desired flavour listed. Bottom Tier: Red Velvet cake covered in white fondant, with extensive stencil work around the entire tier. Middle Tier : Again Red Velvet and also covered in white fondant. This tier was left with a smooth finish, but had Natasha & Joseph’s initials made from fondant place on the front side of middle tier. Diamond ribbon was also placed around the base of this tier to tie in with the advised cake stand. Top Tier: Cream Cheese cake and as with theme of cake covered in white fondant. The top tier was then given a padded effect and clear diamonds placed in intersections of padding, this was then completed with couples initials cake topper. Wedding cake was assembled the night before and delivered as is to reception venue. 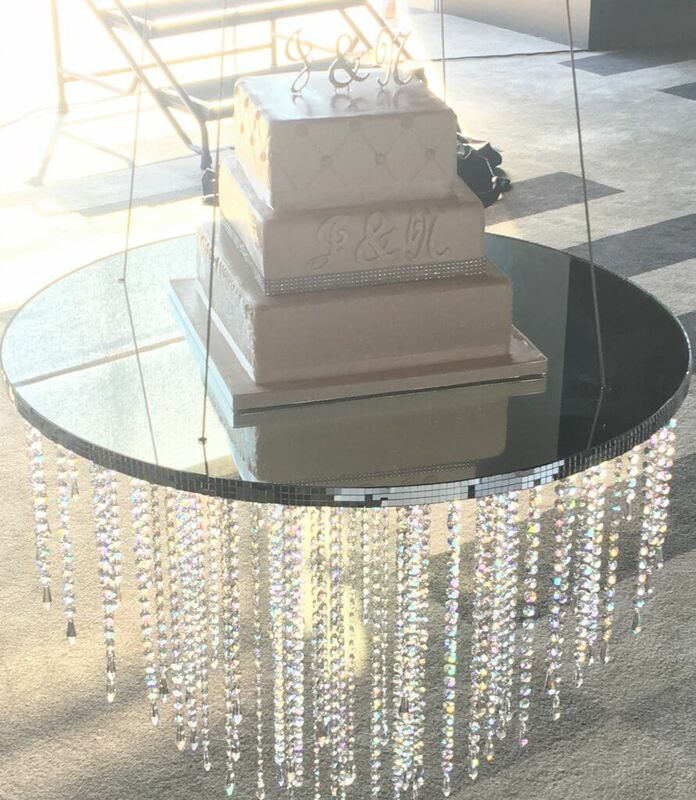 The cake was placed on a suspended swing with a mirror base, this really did have a dramatic effect and looked amazing in the selected location. Overall a beautiful cake and when placed on display swing did set the scene for a wonderful night and beautiful location. We would like to thank Natasha & Joseph for choosing Rimma’s Wedding Cakes, and wish you a wonderful life together.